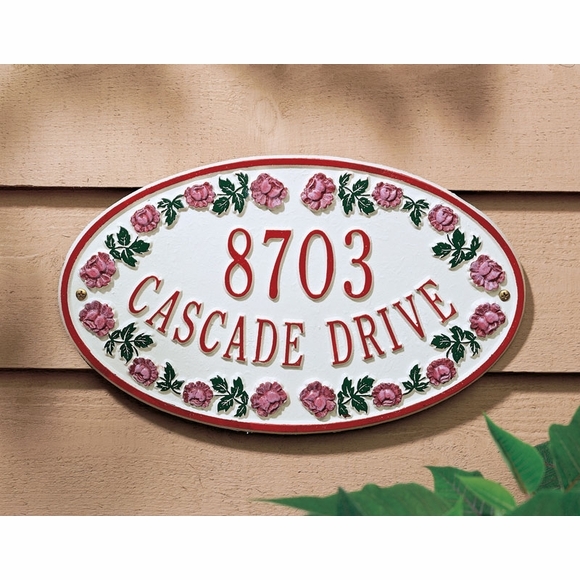 Catalina Personalized Rose Address Plaque - - one line or two line 13.25" x 8" oval address sign with an eye-catching vibrant rose design. Made in USA. Red address and border with red rose and green foliage trim all around. One or two line 13.25" x 8" rose address sign. This charming plaque is a reminder to stop and smell the roses as you come and go. Its a gift for my daughter in law I am sure she will love it very.nice quality.